Contractors... Get this on your website today! Imagine all the homeowners that are looking for a kitchen design & contractor every day. 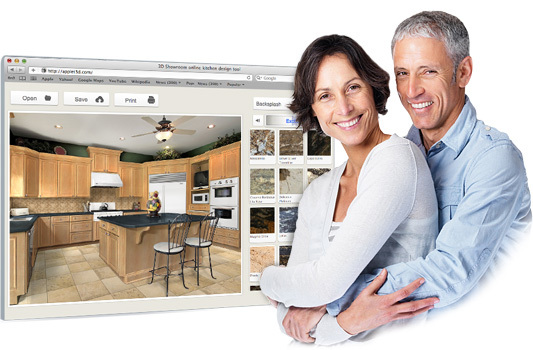 Now imaging they find your website and start working with your kitchen visualizer choosing their kitchen cabinet door styles, cabinet stain & finishes, door handles, granite counter tops, tile & wood flooring, paint & more. They are going to be so interested in this visualizer that it gets them to you for an estimate! If you are looking for an affordable investment to get more traffic to your website, and close more kitchen remodeling contracts, then you should contact us today to see how easy it is to get this nice kitchen design visualizer installed on your website today! Try the Kitchen Visualizer Now! We have the secrets other contractors want to know! We specialize in helping contractors & remodeling experts in the home improvement industry. We fully understand what you need to get your site to stand out and ranking on the search engines. If you remodel kitchens this kitchen visualizer is a must have to set your website above others in your industry. Ever Wonder Why Some Contractor Websites Rank Higher Than Others? Their website has real, unique content on their site that clients find useful and they spend time on the site reading it. The design & layout are professional and everything works. Their website link structure is great. The contractors website has good, clean off-page SEO done with back-links, article posts, social media, video & more. The Contractor Website was built by a Professional! Visit our website for more information about websites & SEO for Contractors! Many Contractors are so quick to pay for ongoing advertising, but they don’t want to spend any money on their website. When your advertising funds run out… the phone stops ringing! Companies that invest their advertising money into their website keep their phones ringing. The website works 24/7 even if your are broke and out of money… it just keeps on working. How nice is that? Spending money on advertising is not a bad idea, but it should always be “Plan-B” and only after your site is ranking good on Google and other search engines. It’s NOT a secret on how some Contractor Websites rank on the 1st page… THEY SPEND MONEY ON THEIR WEBSITE!